FRAMINGHAM, Mass. & BOSTON--(BUSINESS WIRE)--Sep. 14, 2016-- Staples, Inc. (NASDAQ: SPLS) and Workbar announced today that three initial Workbar at Staples locations are now open in the Greater Boston community. Staples and Workbar together are creating more productive workplaces for small business customers, independent professionals, startups and the growing mobile workforce with the Workbar at Staples facilities located within redesigned Staples stores. The innovative collaboration is driving the workplace of the future where a coworking membership is as common as a gym membership. Work schedules and environments are changing due to the fact that 30% of Americans are self-employed (Pew Research Center). People need new ways to do their work, yet still have a community interaction with a network of like minded people. Coworking is a next-gen business service now available at three Staples locations. The Workbar at Staples locations are in Danvers, Norwood, and Brighton, which are north, south and west of Boston. Each of the 2,500 - 3,500 square-foot custom-designed facilities feature a mix of high-end workspaces, conference rooms, private phone rooms, fast and secure Wi-Fi, printers, natural light, and bottomless coffee and tea to keep the connectivity and productivity flowing for business customers. The vibe is free. “The new Workbar at Staples locations align so well with our mission to create a network of high quality workspaces with all the amenities of an ideal office coupled with a diverse, vibrant community that enhances our Members’ business and personal lives,” said Bill Jacobson, CEO and co-founder, Workbar. 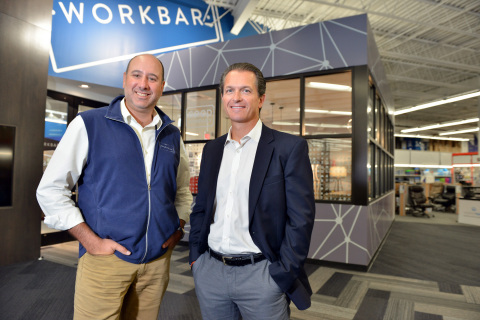 Workbar at Staples membership costs $130/month and includes use of a single Workbar at Staples location and two days access to the 15 other Workbar Network locations throughout greater Boston. Membership also includes two hours of reservable room access. For an extra $100, members can purchase an additional 10 hours of reservable room access. The Workbar at Staples membership offers unprecedented regional access and value for such a high quality coworking space. A special $100 per month Founding Member Offer, including 10 hours of meeting room time, is ongoing for the first three months, with sign up before Oct. 1, 2016. Delivering on the value that Workbar offers member in all its locations, Workbar at Staples locations are operated by Workbar with access to its in-person and online community – a network that offers tips and advice, has connected investors and great ideas, and regularly yields partnerships or job offers. To learn even more or to schedule a personal tour, please visit us at www.staples.com/workbar or http://www.workbar.com/staples.